Studebaker-Packard was living on borrowed time in the late 50’s. Forced to find niche markets after their earlier attempts to compete with the big three, Studebaker decided to create a car to undercut the value leaders of the time. The result was the Scotsman (even the name implied Scottish frugality), a stripped down version of the Champion that was introduced in May of 1957. Three models were available: The $1,776 two-door sedan, a $1,826 four-door sedan and a $1,995 two-door wagon. The Scotsman was equipped with a 101 hp, 185.6 cubic inch L-head six capable of excelling the Scotsman from 0-60 in a snails pace time of 21 seconds. Every expense was spared in the Scotsman. Exterior chrome was on the bumpers only and almost all Champion body trim was removed or painted. Paint colors were Lombard Green, Admiral Blue and Highland Gray, all flat and industrial looking. Utilitarian interiors came with “breathable Naugahyde and pin-grain vinyl” upholstery, fiberboard door panels, no armrests, a single visor and vacuum operated windshield wipers. To top off the features of the Scotsman, turn signals and a basic heater were included. If you wanted a radio, whitewalls or a cigarette lighter you would have to look elsewhere. Even the dealers were prohibited from adding these extras. 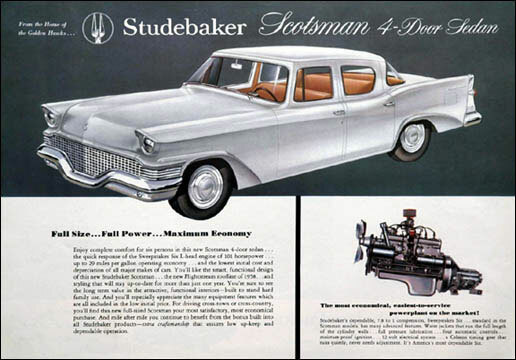 Helped buy budget conscious buyers during the 1957-1958 recession, the unglamorous Scotsman did enjoy some success for Studebaker but after 1958 the Scotsman name only continued into 1959 as a pickup name. This entry was posted on Friday, April 3rd, 2009 at 3:08 pm	and is filed under Studebaker. You can follow any responses to this entry through the RSS 2.0 feed. You can leave a response, or trackback from your own site.